The U.S. Naval Sea Cadet Corps is a national youth leadership development organization that promotes interest and skill in naval disciplines while instilling strong moral character and life skills through leadership and technical programs modeled after the Navy's professional development system. USNSCC is comprised of two programs. The Naval Sea Cadet Corps (NSCC) program is for young people ages 13 through the completion of high school. Also included under the USNSCC umbrella is our junior program the Navy League Cadet Corps (NLCC), for young people ages 10 through 13. 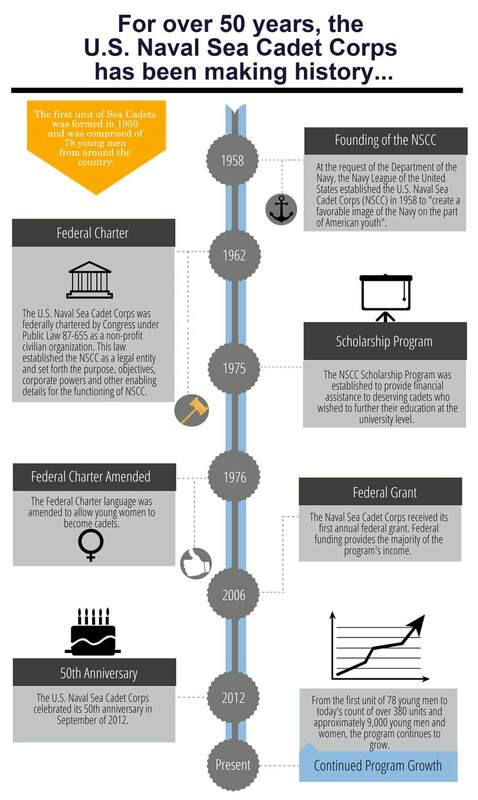 At the request of the Department of the Navy, the Navy League of the United States established the USNSCC in 1962 to "create a favorable image of the Navy on the part of American youth". ​“The U.S. Naval Sea Cadet Corps (USNSCC) is a federally-chartered non-profit youth organization for young people, ages 10 through the completion of high school. USNSCC is comprised of two programs. Our senior program, the Naval Sea Cadet Corps (NSCC), is for young people, ages 13 through the completion of high school. Our junior program, the Navy League Cadet Corps (NLCC), is for young people, ages 10 through 13. The wearing of U.S. Navy uniforms (modified with USNSCC patches) and hands-on, exciting training aboard U.S. Navy/Coast Guard ships and shore stations make us unique among all other youth programs. Cadets have regular opportunities to train with Active Duty and Reserve military personnel. With close cooperation with all branches of the sea services, we offer demanding and rigorous training designed to prepare youth for all walks of life, whether they choose to pursue military service or civilian life. We are sponsored by the Navy League of the United States and supported by both the U.S. Navy and Coast Guard. Our individual units are sponsored by their local Navy League councils and/or by other local organizations. Our cadet corps is run by an all-volunteer force. Cadets meet regularly with their local unit, participating in a variety of hands-on, outdoor training events, as well as community service activities. During school vacations, cadets participate in one- and two-week training evolutions at U.S. military installations around the country where they learn lifelong skills and how to become leaders in their units, schools and communities. The benefits of the program to America's youth are undeniable. Our program provides numerous benefits to its cadets – both tangible and intangible. Our cadets and alumni often cite the feelings of pride, camaraderie, respect and honor associated with their experience in the program. These immeasurable benefits are very important to us. They define us. USNSCC engenders among its participants the value of an alcohol-free, drug-free and gang-free lifestyle. Through exposure to a unique team-centric, objective-based environment, cadets learn to demand the best from themselves and others. The program also provides quantifiable benefits to its cadets. Cadets who enlist in the armed services are often eligible for military advanced pay grade programs (up to two grades in some services). This means that a cadet who enlists in the Navy may be eligible for a higher rank and pay than his or her non-cadet counterpart. Being a cadet can also help individuals become more competitive for certain programs. More than 10 percent of the midshipmen in the most recent entering class at the U.S. Naval Academy were former cadets, a figure consistent over the past decade. The program provides cadets with not only the motivation and encouragement to pursue their goals, but also concrete assistance in achieving them. Annually, 17 different scholarship funds are awarded to exceptional cadets who wish to pursue a college education."